Design and function perfectly united! hobs and the sink are inserted into the working surface space-saving. The variable cover provide you additional worktop as you only can uncover the hob you really will use. The large drawer compartments can easily store your supplies and even large pans and pots. Also the kitchen overhead lockers are developed for variable use: The height-adjustable shelves which can be easily shifted. A real security advantage is the gas check valve with an easy access on the kitchen front. 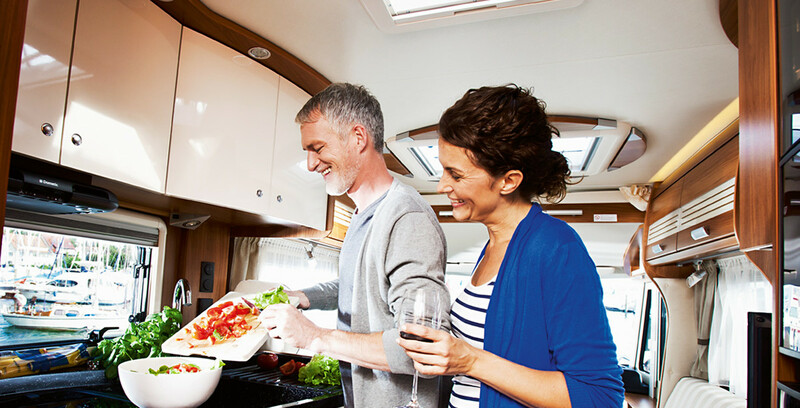 The Gourmet kitchen centre is not installed in any motorhome models but its good solution ideas you will find everywhere. (optimal energy selection between gas, 12 V or 230 V).